A novel elastin-binding, Gadolinium-based low molecular weight contrast agent, BMS753951 (Bristol Myers Squibb, Billerica, MA) may be useful for visualization of the artery wall by delayed-enhancement magnetic resonance imaging (MRI). Synthesis and degradation of the extracellular matrix (ECM), including elastin, plays a central role in the natural progression of atherosclerosis. In particular, excessive ECM degradation in the advanced plaques has been suggested to be associated with plaque instability. Because elastin is involved in remodeling of the ECM in the atherosclerotic artery wall, we sought to study uptake patterns of BMS753951 in the thoracic and abdominal aorta of atherosclerotic mice by delayed-enhancement MR imaging. Mice ageing 6 months lacking both apolipoprotein E and the cytoplasmic domain of tissue factor (ApoE-/- TFΔct) were fed on hypercholesteraemic diet for 3 months. 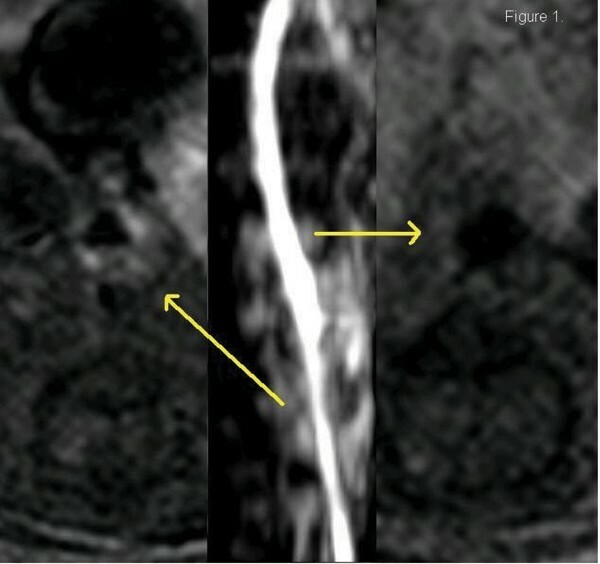 Then MRI from the aortic bifurcation to the level of diaphragm was performed using a 1.5-T clinical scanner (Achieva, Philips Medical Systems, NL) equipped with a small single loop animal coil (∅ = 47 mm). Course of the aortic lumen was displayed for the assessment of atherosclerotic narrowings and planning of the vessel wall scan on 3D time-of-flight (TOF) fast gradient echo angiography (field of view 30 mm, matrix 100 × 100, in-plane resolution 0.3 mm, slice thickness 1 mm, 32 slices, TR/TE 26/5 ms, flip angle 60 degrees) and coronal maximum intensity projections. Forty five minutes after injection of 0.2 mmol/kg of BMS75395, delayed-enhancement imaging using a 3D gradient echo inversion recovery sequence (field of view 35 mm, matrix 292 × 292, in-plane resolution 0.12 mm, slice thickness 1 mm, 32 slices, TR/TE 37/10 ms, and flip angle 40 degrees) was performed to detect contrast uptake within the aortic vessel wall. The inversion time was adjusted to null blood by simulating plasma concentration of Gadolinium as a function of time (typically ≈ 300 ms). After the imaging experiment, animals were euthanized and aortas were collected for immunohistochemistry and examination of the elastin content. The extent of atherosclerotic lesions was analyzed by Sudan IV staining. Time-of-flight angiography showed significant luminal narrowing in the subrenal aorta when compared with the suprarenal aorta in all atherosclerotic mice. On average, the maximal luminal narrowing was 55 ± 4.7%. Contrast uptake after injection of BMS753951 correlated well with sites of luminal narrowing and showed some slice-to-slice and intraplaque heterogeneity (Figure 1). Delayed enhancement was strongest at the luminal side of the investigated plaques. In the areas showing highest enhancement average contrast-to-noise ratio (CNR) between the vessel wall and aortic blood was 22.2 ± 5.5. 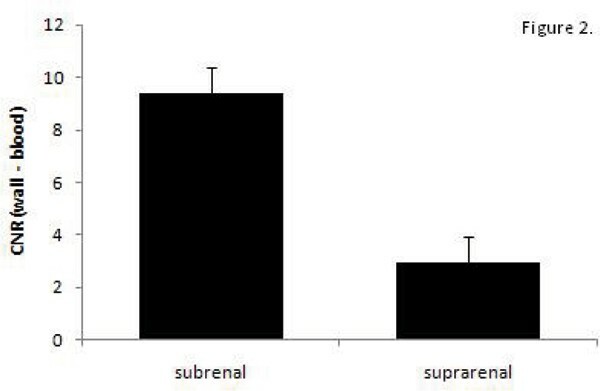 Per cross section, average CNR between the vessel wall and aortic blood at the site of luminal narrowing was 3.1 times higher than in the suprarenal, non-stenosed aorta (9.4 ± 1.4 vs. 3.0 ± 1.0; p < 0.01, Figure 2). Delayed-enhancement MRI demonstrated focal uptake of a novel gadolinium-based elastin-binding contrast agent in the atherosclerotic abdominal aorta of ApoE-/- TFct mice with little uptake in the non-stenotic suprarenal vessel segements. Delayed-enhancement MRI demonstrates focal uptake of a novel gadolinium-based elastin-binding contrast agent in the atherosclerotic abdominal aorta of ApoE-/- TFΔct mice with little uptake in the non-stenotic suprarenal vessel segements. In addition, contrast uptake appeared to co-localize with the fibrous cap and thus may be potentially useful for the detection of unstable plaques.